The Yaowarat and Phahurat Tour is a one day and night guided walking tour through Yaowarat and Phahurat, the home of Bangkok's sizable Chinese and Indian communities. Yaowarat and Phahurat certainly don't take first place on the Bangkok to-do list of most travellers. Most will recognise Bangkok as a city of must-see temples, palaces, bazaars, shopping malls and go-go bars, and while most of that can also be found in in this district, what makes these neighbourhoods different is their lack of big attractions. No "must-sees" to be found here, just a lot of sights you could see if you feel like it. But don't push it — the area is best experienced by watching and enjoying the general atmosphere. Just walk through the tiny alleys, browse through what the markets have to offer (usually the weirdest of products) and eat what the locals eat (again, probably something you never thought of). Bangkok is a hot city, and you will quickly notice that the heat in Yaowarat and Phahurat is even worse than elsewhere in the city: no air-conditioned shopping malls to cool you down, just large trafficked motorways, elevated smog levels and endless tiny alleys that really start heating up in the early afternoon. Buy and drink enough fluids, but don't carry huge bottles of water in your backpack, as there are plenty of markets and convenience stores selling cooled beverages. As you will be walking most of the time, wear light and comfortable shoes and dress for the climate. Don't go overboard though, pants and shirts must have long sleeves as you will visit sacred temples and shrines. Start out early if you can, as this tour will probably take the whole day. The route starts at Si Phraya Pier, proceeds to Yaowarat, then ventures through Phahurat and in the evening you will go back to Yaowarat to see its blazing neon lights at work. Do not trust maps — the map that perfectly shows every little alley of Yaowarat still has to be created. Be sure to print this article and the corresponding map, so you have a general overview of the area while walking. You will get lost — but as long as you have the map, you will somehow find your way back on track. You may want to print the Yaowarat and Phahurat district article for alternative listings. Another piece of advice is that the route is not fixed. Skip any attraction that you find uninteresting, have no time for, or is too far off. As said before, there are no must-sees here, so you won't miss anything remarkably special. First take the Chao Phraya Express Boat to Si Phraya Pier (N3). While walking out through the small alley, you can see a canal boat used as fish tank to the left. When you see the main road, walk left to the shopping centre River City. In mornings and afternoons, the mall might feel quite empty, but it's actually the best place in the city for expensive antiques and other cultural objects. Note that real antiques and any religious images will require export licences, the shops can arrange this for you (for a fee). Downstairs is a small art gallery, and it might also be a good idea to go visit the restroom at one of the upper floors. When leaving the mall, you might see the sign "Gateway to Chinatown" and a map of a guided tour through the area. That tour is different from the one shown here, though some places are visited in both tours. From River City, take a left into a small market on Soi Wanit 2. Here you can get some snacks from a cart and take a seat before the big hike. You can also get some water around here if you wish. From the market you can see the Holy Rosary Church, often called Kalawar Church by locals. It is a Catholic church built in 1897 in neo-gothic style architecture. Seeing it from the front side is complicated, as a school yard takes up all the space. When you leave the church, take a left and try to find the riverside Siam Commercial Bank Building, the first commercial bank set up by Thais. It was built in 1906 in art-deco style, a style that was popular at that time. It is hard to find though, but is easily seen from the Chao Phraya Express Boat service. Take another left and continue the path. Then take a right into Trok Talat Noi, a small lane that brings you to the Noi Market, a local market with Chinese products. Most tourists don't know about this place, so it's a nice way to see how the locals live. You might even walk through some living rooms. Walk back to the main road and take a right. You'll be walking through the Sieng Kong Zone, a small area with larger-than-human-sized piles of oily car parts. Most locals here have a job in the car part industry and you will see plenty of Chinese workers getting their hands dirty. Walk further on Wanit 2 and you will stumble across Wat Pathum Khongkha, often called Wat Sampeng. It was built in the Ayutthaya period, and has recently been restored to its current state. Now take a right onto Tri Mit Road, and head for the Chinese Arch at the Odeon Circle. Officially known as the King's Birthday Celebration Arch, it sets the stage for Chinatown. It is built by the Thai-Chinese community and was unveiled on December 5th, 1999 to show their loyalty to the Thai royal family. The big four Chinese characters on the monument mean 'Long Live The King' and are in the handwriting of Princess Sirindhorn (who is fluent in Chinese). When standing under it, it feels like a giant monument, but it's easier to take a picture of it by crossing the road. Now continue in the same direction and take a left for Wat Traimit. The golden-white building cannot be entered, but looks nice for photographs. The real feature of this temple is the Phra Sukhothai Traimit, the largest solid gold Buddha image in the world. In the end of the Ayutthaya period, the image was covered with plaster to hide its value from enemies invading Thailand. It was hidden for centuries until the image was being moved to a new vihara in 1954. The plaster was accidentally broken, revealing its inside being solid gold. It led to a gold-craze of Buddha images all over the country. Walk back to the King's Celebration Arch and take a right into Yaowarat Road. At the left, you will see the Thien Fa Foundation, a local medical treatment centre which uses modern as well as traditional Chinese practices. Also interesting is the Kuan Yin Shrine, a Buddhist temple from the Mahayana school, which is quite different from the Theravada school practiced by Thais. Plenty of Chinese locals light a candle here to get a blessing. Look at the neon sign chaos in front of you! Now it really starts to feel like Hong Kong. If only it was nighttime with all the neons shining... don't worry, that will come later. First take a right at the crossing with Plaeng Nam Road. This road has an authentic atmosphere with some old Chinese shops, and there's always someone playing a traditional Chinese musical instrument at Guang Jiab Xia. Cross Charoen Krung Road into Phlap Phla Chai Road, and you will see the Li Thi Miew Temple with several shrines on the left. The roof shows two dragons playing with a pearl, as is common in Chinese temples. In the compound next to the main temple building, you will encounter a large shrine dedicated to the goddess Guan Yin. You could walk straight into Trok Issaranuphap if you're in a hurry, but you might want to see Wat Kanikapon by walking just a little bit north. It can be hard to find as there are plenty of other temples in the area (which are also very lively). It is mostly known for the fact that the madame who founded it used to own a brothel. Then walk into Trok Issaranuphap, which is sometimes called Charoen Krung Soi 16. This part of Trok Issaranuphap is the most authentic part, as not a lot of tourists head this far north. It is a covered walkway with Chinese salesmen selling a plethora of things. You're lucky if it starts raining — you'll see all the shop owners cover their products with plastic in a matter of seconds! When you get to Charoen Krung Road, take a right into it, and another quick right into Wat Mangkon Kamalawat. This is a very lively temple with many (Chinese) locals leaving offerings at the altars. Right after the second gateway is the most interesting part, with four statues of sages holding respectively a parasol, a pagoda, a snake's head and a mandolin, symbolic objects in Mahayana Buddhism. The market along Trok Issaranuphap continues south of Charoen Krung Road, where it is known as Talat Mai or the New Market (which is still more than one hundred years old). Essentially, it is a packed dark alleyway and a typical Chinese food market with ginseng roots, fish heads, chocolate cookies and other delicious foodstuffs. Don't run through here — enjoy the market, just casually walk around and browse through what the merchants have to offer. Who knows what you might end up with. Even if you're not buying anything, the busy atmosphere and exotic products make this a sensual experience. At the left is the Leng Buai Ia Shrine, the oldest Chinese shrine in Thailand. This claim is based on the plaque inside with a Chinese inscription that states that the shrine was built in 1658. That year corresponds to the Ayutthaya period, far before Bangkok became the capital of the country. It is housed in a traditionally Chinese architectural style-building. Inside there is a shrine dedicated to Leng Buai Ia and his wife in the centre, a shrine dedicated to the deity Going-Wu on the left and a shrine dedicated to the Queen of Heaven on the right. You might be getting hungry, and the market at Trok Issaranuphap is excellent for getting some cheap meals. Just take a seat at one of the numerous street restaurants or food carts. Hongkong Noodle is a good choice for cheap noodles in the middle of the market. A meal won't cost you more than 30 baht. When you're done eating, cross Yaowarat Road. 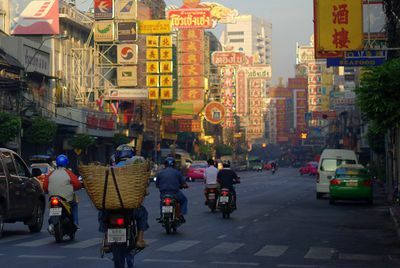 In the morning, the Talat Kao or Old Market is running here, and old it is — it has been up and running since the late 18th century. But as it's probably afternoon already, the market changes its emphasis from a food market into a more mainstream one. Continue south and take a right into Sampeng Lane, sometimes called Soi Wanit 1. This lane is the oldest part of Chinatown, and it used to be a shady place with gambling houses, opium dens and brothels. Now it is, what else, a market, mostly with tacky goods for teenagers. It's still good if you want to pick up cheap toys, ceramics, jewellery and accessories. So-called "department stores" fill the lane, though usually they are just a small collection of grouped stores (not more than two floors). At the crossing with Mangkon Road, you will stumble across Tang To Kang Gold Shop. This gold shop is 130 years old and houses a private museum about the art of gold smithing. Opposite the gold shop is the Bangkok Bank Building, which exterior is another example of classic early Rattanakosin-style with clear European influences. Just take some snapshots and continue the route. When you pass the crossing with Rachawongse Road, the market changes its emphasis to clothing and fabrics sold by Indian merchants. 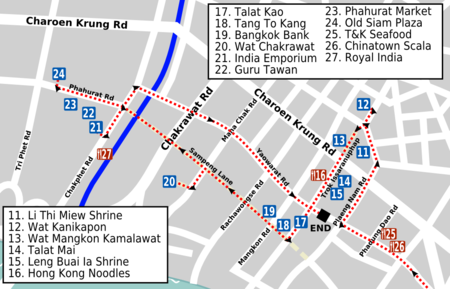 If you're really a temple-nut, you could take a left into Maha Chak Road, and then take a right into a small alley for Wat Chakrawat (if not, just skip this section). The temple is not that memorable, but some visitors like to come here for its remarkable atmosphere. There is a crocodile swimming in the pond, monkeys and dogs are slogging around and birds keep tweeting from their cages. The locals do not seem to care one bit about the occasional traveller passing by, and just keep on playing their board games. When you're done exploring, walk back to Sampeng Lane and we're back on track. If you just wanted to see Chinatown by day, or you're short on energy, you can walk south along Rachawongse Road to the river and take the Chao Phraya Express Boat home. It's better to keep on walking though, as there is still a lot left to do. When you reach the end of Sampeng Lane, the ethnic make-up slightly changes from Chinese to Indian. Take a left onto Chakphet Road and you will quickly find India Emporium at the other side of the road. It's a modern mall with many stores selling fabrics and accessories. When looking in the sky, you might see the huge Guru Tawan Sikh Temple with the golden dome, the second-largest Sikh temple outside of India. It can be visited but you must take off your shoes and cover your head with a cloth. For an authentic experience, try to find the Phahurat Textile Market. Yes, try, as it can be quite a task to find it. It is in the backstreets behind India Emporium, south of Phahurat Road, and you have to walk through some stores to get inside. You know when you've found it though, as it is a labyrinth of narrow lanes filled with cheap fabrics sellers. It feels cramped, and you might bump into someone, but that's just part of the fun. Around the fabrics market are plenty of other small markets as well. Browsing is not as rewarding here as in Chinatown, unless you're interested in Bollywood movies or Punjab sweets. If you got some time left you can walk up north to the Old Siam Plaza, a European colonial-style shopping mall selling diverse products like branded and second-hand clothing, gadgets, electronics, handicrafts and gold futures (if interested). You might want to buy some of the excellent local sweets and desserts from the first floor. Surrounding the mall are a dozen of gun shops. As promised before, you should see Yaowarat's neon lights in action, as well as getting your stomach filled with some delicious Chinese delicacies. For this, head north from India Emporium on Chakphet Road and then head east into Yaowarat Road. What you saw before was only a sleeping giant. 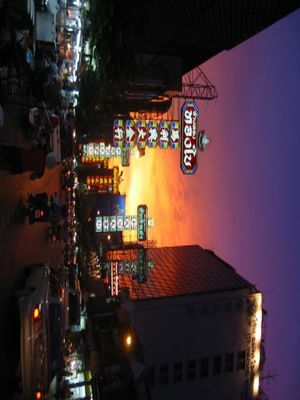 At night the atmosphere changes completely as gigantic neon signs are turned on and the plastic seats of the restaurants spill out onto the streets. You'll probably want to make some nightly pictures of the signs (if you have a good camera). Yaowarat at night is a vibrant place with restaurants, carts and markets that never seem to close. Now you have to choose where you want to eat. Phadung Dao Road has the city's best selection of Chinese restaurants, many of which specialise in expensive delicacies like shark fin soup, bird's nest or fresh sea food (often still swimming in tanks near the entrance). T&K Seafood is hailed as as the best barbecued seafood restaurant in Bangkok, and masses of people generally stand out in front of the entrance waiting to be seated. It looks very cheap and basic by Western standards, but it has great local atmosphere and delicious barbecued prawns make more than up for it. You can also take one of the air-conditioned seats upstairs as you're probably tired of today's long hike. If you're looking for shark fin soup or bird's nest, you might want to visit China Town Scala instead, which is more expensive. If you're on a tighter budget, an alternative could be to go food cart hopping, a popular activity among Bangkok's residents. Food carts and street restaurants come in many varieties and flavours, and simple meals go for about 50 baht per dish. 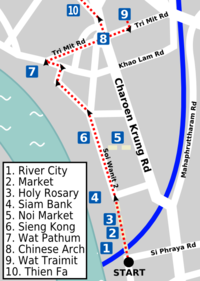 Many of them line the streets in and around Yaowarat Road, Plaeng Nam Road and Phadung Dao Road. If you're in a group, you are especially well off as most of the dishes are meant for sharing. Once you're done with a meal, just get up and take a seat at the next vendor. The carts mostly specialise in Southern Chinese fare, including dim sum, Chaozhou-style steamed Chinese mullet and various noodle and rice dishes. An obvious alternative to Chinese food is having some of Bangkok's Indian cooking in Phahurat. From India Emporium, cross the road and walk south on Chakphet Road. After about 200 metres, you will see the Royal India Restaurant sign. This restaurant is your best bet for quality Indian food, as its curries have won many awards. Expect to pay around 250 baht for a meal. The only downside is that other tourists seem to know about this place as well. When you're done with eating, you could call it a night and go back to your hotel. Another option is to flag a metered taxi down and head for Pak Khlong Talat, a short ride that doesn't cost more than 50 baht. Pak Khlong Talat is a wholesale flower market, but also caters for local visitors and foreigners that want to surprise their loved one. There are gazillions of flower shops here, and they sell for budgets as low as 50 baht. So buy your partner something pretty! The chaotic atmosphere, as well as its vast size, make the market well worth the stroll. Lights illuminate the area and the flowers make it a colourful sight at night. There is a night market under the Memorial Bridge that is open between 20:00 and 00:00. Products for sale are mostly cutesy accessories for teenager girls, but it's still a fun walk. The stores use all kinds of colourful lights to catch the eye of potential customers. As Yaowarat and Phahurat are remarkably off the traditional tourist track, there is less to worry about than elsewhere in the city. The gem scam, 20 baht tuk-tuk rides and "lucky Buddha day", it is exception rather than rule if you encounter these typical Bangkokian annoyances. The general rules apply here though, so avoid tuk-tuks, and insist on the meter when taking a taxi (else leave the car and take another one). Yaowarat is filled with gold and gem stores, but even here its probably wiser to buy these products at home. And again, the extreme heat of Bangkok is not to be underestimated, so dress for the weather and always keep drinking. Another safety issue is the roads with heavy traffic: be very careful when crossing them, and use the overhead pedestrian bridges where available — they are there for a reason! This is a star article. It covers the route completely with great information and visuals. If you know of something that has changed, or have new information to add, please plunge forward and keep it fresh! This page was last edited on 9 February 2018, at 12:53.